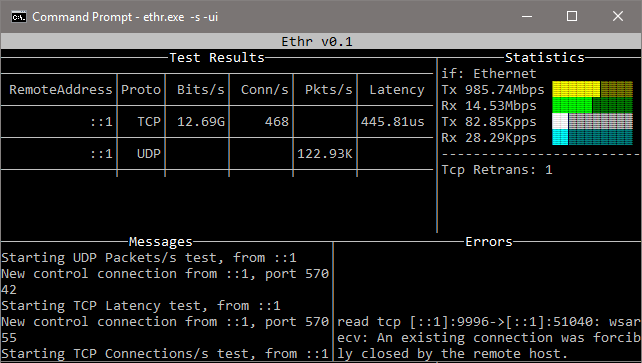 Ethr is a cross platform network performance measurement tool written in golang. The goal of this project is to provide a native tool for comprehensive network performance measurements of bandwidth, connections/s, packets/s, latency, loss & jitter, across multiple protocols such as TCP, UDP, HTTP, HTTPS, and across multiple platforms such as Windows, Linux and other Unix systems. Ethr is natively cross platform, thanks to golang, as compared to compiling via an abstraction layer like cygwin that may limit functionality. It hopes to unify performance measurement by combining the functionality of tools like iPerf3, ntttcp, psping, sockperf, and latte and offering a single tool across multiple platforms and multiple protocols. Note: go version 1.11 or higher is required building it from the source. We use go-module to manage Ethr dependencies. for more information please check how to use go-modules! If Ethr is cloned inside of the $GOPATH/src tree, please make sure you invoke the go command with GO111MODULE=on! docker build -t microsoft/ethr . Disable logging to file. Logging to file is enabled by default. Enable debug information in logging output. Show output in text UI. Use custom port numbers instead of default ones. A comma separated list of key=value pair is used. Key specifies the protocol, and value specifies base port. Ports used for various tests are calculated from base port. Control is used for control channel communication for ethr. Note: Same configuration must be used on both client & server. Run in client mode and connect to <server>. Server is specified using name, FQDN or IP address. For Bandwidth tests, send data from server to client. Number of Parallel Sessions (and Threads). No Connection Stats would be printed if this flag is specified. Only valid for Bandwidth tests. Max 1GB. Default: b - Bandwidth measurement. Number of round trip iterations for each latency measurement. '-m x' MUST be specified for external mode. Key specifies the protocol, and value specifies the port. Run in external client mode and connect to <destination>. <destination> is specified using host:port format. Example: www.microsoft.com:443 or 10.1.0.4:22 etc. Todo list work items are shown below. Contributions are most welcome for these work items or any other features and bugfixes.